Every holiday season shelters across Toronto are inundated with requests for help and support from families struggling during our harsh winter. While the reasons they need help vary (abuse, poverty, illness) their need for help, and hope, is undeniable. Santa Comes to Bay Street allows families that might otherwise have nothing, to give their children (and themselves) the necessities for the winter - and maybe more importantly (to a child at least) - a gift to open during the holidays. How it works is simple: donors give either primary gifts (from specific wish lists created by the families), cash, their time, or any combination of the three. 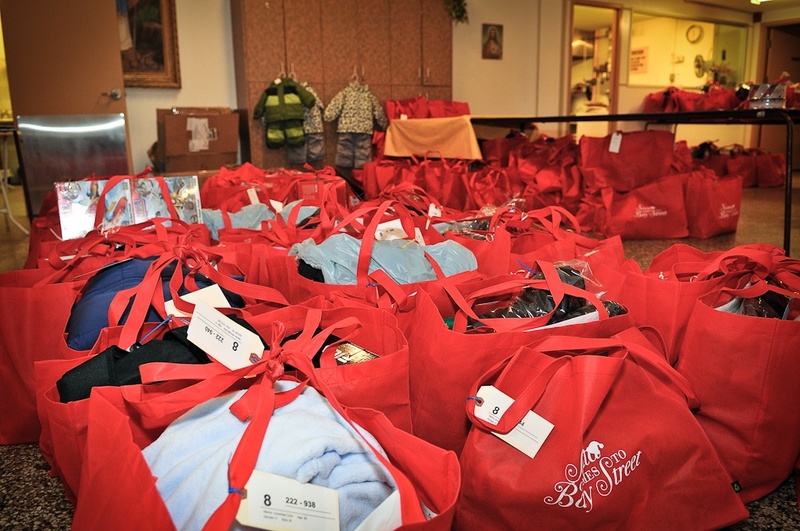 Once a year an event is held where these generous donations are combined to create gift bags for families in need. 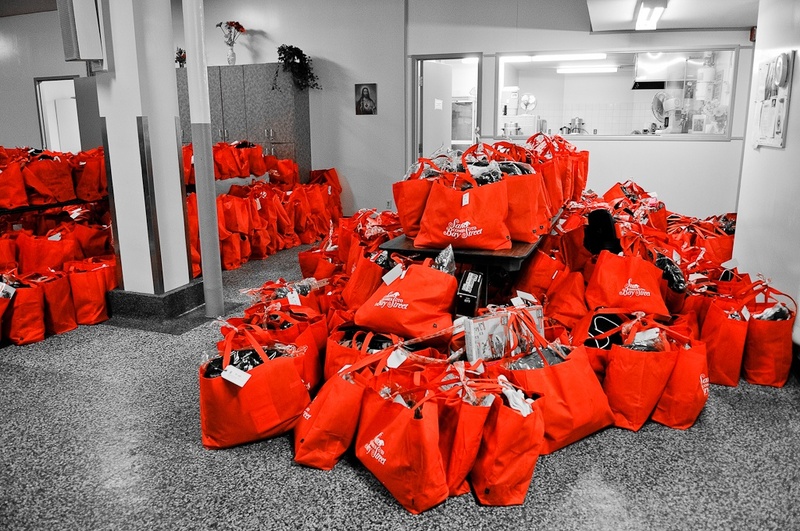 These bags contain the primary gift along with the necessities (warm coats, hats, gloves, etc) for getting through the winter. How you can help is also simple: pick recipients to shop for, donate cash, or volunteer! While our need for all three things is great, we believe that one of the most fulfilling things you can do this holiday season is "shop for a bag" for people in need. If you pick recipients all you need to do is sign-up, select people you wish to buy for, and then go out to the store and purchase for the people you picked. You will receive a confirmation e-mail for the person(s) you selected including all the information you need to purchase a personalized gift. You don't need to buy any necessities for them, just what they asked for as their primary gift (usually their primary interests are mentioned in the notes). Spend between $25 and $35 per recipient and then bring those items to the Event (held this year at the Design Exchange, Monday, November 26, 2018). You don't need to bring anything but the gifts you purchased (and receipts if you want a tax receipt), we have everything else (gift bags and necessities). At the Event your gift will be "bagged" by either yourself or volunteers. This means going around to our various tables that hold the necessities and filling up the bag with all the necessities (and your gift). When it's all completed the various shelters come by and collect the bag(s) and you will have helped make someone's holiday a whole lot brighter!